13 December, 2007: This year, there is a strict code of conduct which all gelong and gelongma attending Kagyu Monlam must observe. All gelong and gelongma will have undergone three days training and a test in this code of conduct. During the Monlam they will be expected to attend every Monlam session, including the daily Sojong. They will eat only from the alms bowl, not eat after midday, and, on the final day, they must join the Alms Procession. At a special meeting for gelongma (Sanskrit: Bhiksuni), held in his private room at Tergar Monastery this morning, the Gyalwang Karmapa welcomed everyone who had come to attend the 25th Kagyu Monlam. He then gave a short talk, discussing the reasons why he had specially invited the gelongma to attend the Kagyu Monlam. He recounted how, in 2004, when he took on the responsibility of overseeing the running of Kagyu Monlam, he began looking into the Vinaya and researching codes of conduct. The Tibetan sangha has both gelong (fully ordained monks) and getsul (novices) but no gelongma (fully ordained nuns) only getsulma (novices). Yet, there are many gelongma from other traditions who don Tibetan robes. Because of his concern over the absence of the gelongma ordination in the Tibetan tradition, he began searching the Sutras and the Vinaya, looking more closely into the issues, trying to find a way in which he could help the gelongma. The more he studied, the more his interest and concern grew. There was, however, an obstacle to this research, because, according to the Vinaya, a getsul is not supposed to study the gelong and gelongma Vinaya, and he himself was a getsul. However, because he is a doctrine holder and holds a position of great responsibility, he did study these texts, trusting that he would not incur any fault. After studying the issue, he felt deeply that if there were a gelongma sangha in the Tibetan tradition, it would be a glorious achievement. Gyalwang Karmapa cited two reasons why it had been difficult to establish a gelongma ordination lineage in the Tibetan tradition. Firstly, the Vinaya is the foundation upon which the Buddhist sangha relies, so changes are difficult to make. The constitution of a country cannot be changed immediately, but it can be changed through a lengthy process. Similarly, the Vinaya could be changed, but the process would be very slow. Hence, it would have been difficult to start the tradition of gelongma in Tibet. Secondly, there is the inflexibility of some members of the sangha who think that there is no need for gelongma. 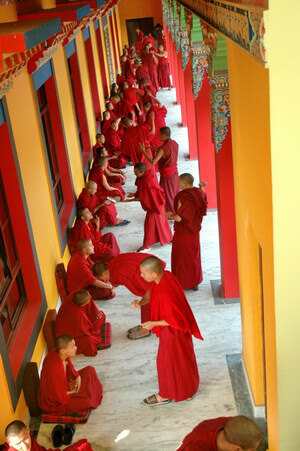 However, the Gyalwang Karmapa explained, it was his hope that the participation of gelongma in Kagyu Monlam, would eventually lead to the establishment of a gelongma sangha in the Tibetan Buddhist tradition, because their excellent conduct would bear witness to all of the grace of the gelongma tradition. He reminded them that they therefore had a responsibility to live up to these expectations. Finally, he said he prayed that all the nuns would stay well and that no obstacles would arise, so that they could attend the Monlam from beginning to end. He concluded by offering each gelongma a complete set of robes. 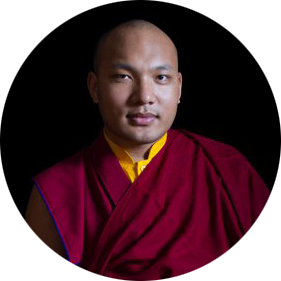 HH Karmapa began his talk by clarifying the origins of the reasons and conditions for Monlam, explaining that Monlam means “aspirations”, giving as an example Shakyamuni Buddha. When the Buddha made the aspiration to attain the mind of enlightenment, he offered a simple bowl of soup. A bowl of soup seems a small thing, but he offered it with pure motivation of the ultimate aspiration for enlightenment. So, although small, its blessings pervaded the whole of space and benefited all beings. Similarly, the power and blessings generated by the Kagyu Monlam depend on the pure motivation and aspirations of each individual participant involved. This may seem easy but in fact is not. Pure motivation requires one to put aside individual concerns and work solely for the benefit of all sentient beings, whose numbers are as limitless as space. Participants need to firmly establish this mindset before the Monlam starts. In order to accomplish this, we need a firm, stable foundation and strong motivation. Without this, when we are confronted with difficulties and stress, we will find ourselves prey to the afflictive emotions such as anger, pride or ego-grasping. Without this, it becomes extremely difficult to maintain both our motivation and aspirations, and without that, we will have lost the whole purpose of the Monlam gathering. If pure, strong motivation extends from the very beginning to the very end, so all will be good in the beginning, good in the middle and good at the end. The purpose and fundamental root of the Kagyu Monlam is to remember the kindness of our Teacher, Buddha Shakyamuni, and to pray for the peace and happiness of all beings with whom we share this world. We are continuing and preserving a pure lineage which we must not blemish. His Holiness warned that taking his remarks simply as “fine words” is not enough, and asked the Monlam participants to accept the great challenge to put the pure aspiration into practice. We need to integrate these words into our mind stream – developing loving kindness and compassion. In the end it all comes down to our own individual intention, whether it is vast and deep or shallow. Respect and co-operation are also essential so that we can become friends and develop harmony and peace, which can then extend throughout the world. If we become annoyed or angry or speak harshly or walk around with black expressions, we defeat the object of Monlam. Transforming the mind is difficult for beginners; it is easier to modify our speech and behavior. But if we are able to do just this, the purpose of Monlam will be achieved. 6th December, 2007. Representatives of the Jonang tradition of Tibetan Buddhism began celebrating its Sixth Monlam Prayer for World Peace at the Mahabodhi Temple in Bodhgaya on 6th December. The Gyalwang Karmapa was requested to attend the Monlam and lead the prayers, and His Holiness attended with Yongey Mingyur Rinpoche. When he arrived, he was welcomed by Chogtrul Ngawang TashiGyaltsen Rinpoche and Khen Rinpoche Choe-kyi Nangpa Chog of the Jonang Tradition. A great crowd of Tibetans, Indians, tourists, and well-wishers, many offering khatas, incense or lotus flowers, were also waiting to greet him. On December 6th , the Gyalwang Karmapa presided over an examination of members of the sangha under a new code of conduct for monks and nuns, which is now mandatory for all members of the sangha attending Kagyu Monlam. The monks were examined by the Committee of Discipline Masters, appointed by His Holiness and headed by Yongey Mingyur Rinpoche. At the request of the Karma Gön Chö committee, His Holiness will give teachings on Gampopa’s Lam Chog Rinchen Tringwa commencing from 20th November. The organizer of the Karma Gön Chö for this year is Palpung Lungrik Jampal Ling. The Karma Gön Chö commenced with the offering of a Mandala to His Holiness from Khenpo Karma Tenzin of Palpung. The Karmapa offers a robe to the image of the Buddha in the renowned Mahabodhi Temple in Bodhgaya. Ven. Bodhi Pal is standing on the left. 9th November: His Holiness left Gyuto temple for his winter tour, travelling by air to Delhi. There, the Secretary to the Bureau Office of His Holiness Dalai Lama in New Delhi and Karma Thopden, former Indian Ambassador to Mongolia and a Member of the Indian Parliament, received His Holiness at Radisson Hotel. November 10: His Holiness arrived at Vajra Vidya Institute (VVI) at Saranath, Varanasi, U.P. Venerable Khenchen Yongzin Thrangu Rinpoche welcomed His Holiness at the Varanasi airport. His Holiness received teachings from Venerable Khenchen Yongzin Thrangu Rinpoche during his stay. District magistrate of Varanasi Mrs. Meena made a courtesy call on His Holiness at VVI. 17th November: His Holiness left VVI by road to Bodhgaya in Bihar. On the arrival at Tergar Monastery at Bodhgaya, His Holiness was welcomed by hundreds of shedra monks from different Kagyu monasteries, who have assembled at Tergar for the 11th annual the Karma Gön Chö Winter Retreat for Debate and Logical Study. The monastics, along with their Serbangs, escorted His Holiness into the main shrine hall. 18th November, His Holiness inaugurated the exhibition of 8th century Tibetan artifacts by Dzongkar Choede Monastery, on display at the Mahayana Guest House in Bodhgaya. 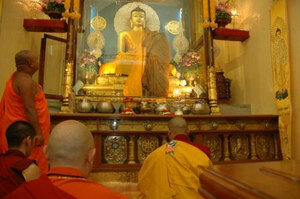 Later His Holiness visited the Mahabodhi Temple to offer a robe to the main Buddha statue. Ven Bodhi Pal of Mahabodhi Temple Management Committee welcomed His Holiness.